Clarks Summit, Pa. – Children and veterans in northeastern Pennsylvania will reap benefits from the owners and customers of Eagle Cleaners in Clarks Summit this November. On Monday, November 12, in honor of Veterans Day, Eagle Cleaners will honor all those who served and are serving by donating revenue from all incoming sales to Equines for Freedom (EFF), a nonprofit organization that treats active and former military personnel who are experiencing symptoms of Post-Traumatic Stress Disorder (PTSD). Also on Veterans Day, the local dry cleaning and laundry business will give a 25% discount to all veterans and those still serving in the active duty, guard, and reserve. “This is our small way to say thank you to all the veterans who protect the freedoms we enjoy today,” say owners Buddy and Kathy Croft. 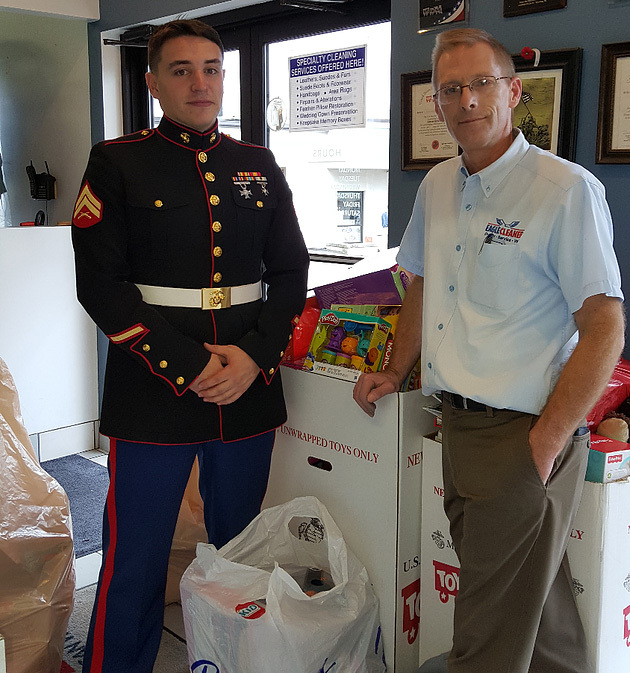 Twenty-one years ago Eagle Cleaners began supporting the United States Marine Corps Toys for Tots program. This year, the donation box in the local business’s Clarks Summit location is already overflowing thanks to the exceptional generosity of customers and community. The owners and staff at Eagle Cleansers look forward to filling several more times several more times throughout the campaign which concludes on December 8. Customers who bring in a new unwrapped toy to Eagle Cleaners to help less fortunate children will receive 10% their order of dry cleaning and laundry. All donations go to children in the local community. Every year since 1947 the Marine Corps Reserve continues its toy-collecting mission because they believe every child deserves a little Christmas. Toys for Tots also accepts monetary donations online. Further information is available by contacting the Wyoming, Pennsylvania Toys for Tots coordinator at 570-587-5580 or WyomingT4T@usmc.mil. EFF uses one of the most effective treatments available; Eye Movement Desensitization and Reprocessing (EMDR) which offers clients a nontraditional approach to therapy. This therapy combines a licensed mental health professional, a certified equine specialist, and a therapy horse to create a research-based treatment model which strives to resolve emotional difficulties caused by disturbing, difficult, or frightening life experiences. The horse is an integral part of treatment because horses are prey animals and therefore are extremely alert and sensitive to the emotions of those around them. Clients learn to identify their own emotional state by observing the horse’s reactions. The horse also helps the client stay grounded as they process past traumas. PTSD is a serious issue that needs everyone’s attention as it is estimated that there are 22 veteran suicides per day due to unresolved emotional difficulties. EFF set out to reduce veteran suicide and has worked diligently to fund well equipped treatment teams. The EFF board of directors is a group of volunteers working tirelessly to find funding through local fund raisers, community support, and a few grants.